A cape can be the superhero of your fall wardrobe, working without any effort to save your office, weekend, and after-hours looks from anonymity. The most recognizable cape has to be Burberry’s customizable poncho. After the models closed the Fall 2014 Burberry Prorsum show, all wrapped in their very own versions, it-girls Cara Delevingne and Suki Waterhouse took the trend right off the catwalk into their own outfits — and they aren’t the only ones who can’t get enough of the silhouette! Sarah Jessica Parker and Olivia Palermo have also sported the hot item. Knowing what to wear with the cape coat style can be tricky. Cape coats can be a bit restrictive, but if you pay a little attention to your outfit choices you can easily make them one of the most versatile pieces in your wardrobe. Not to mention that they are also a fashionable alternative to your normal winter coat or jacket. Here are a few ideas for what to wear with cape coats. Team them with some wide legged jeans for a ’70s inspired feel. The turtleneck top is a must-have piece for creating the layered look, so popular, this season. Wearing it with capes is a great idea. Or go directly to the next level by wearing a knitted turtleneck cape. Keep the rest of your look streamlined with slim fitting pants. How to accessorize a cape: I would say that long gloves are an essential. Cape coats and knee high boots are a match made in fashion heaven – a perfect way for creating a glamorous look. Wear your knee high boots and capes with tights, shorts and dresses. An easy way to get your tomboy fix is to wear color blocking and metallic oxfords. The oxfords represent a mix of charm, chic, feminine and masculine all rolled into one. The women’s Oxford are the perfect way to transition from summer’s wardrobe to the fall wardrobe. 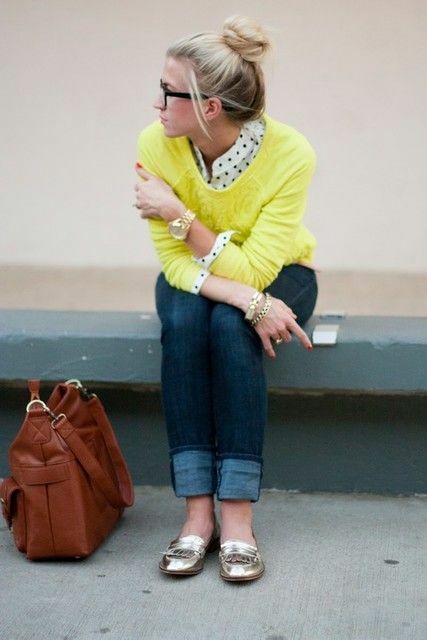 Preppy outfit tip: Oxfords with skinny jeans rolled at ankle, a collared shirt with a (oversized) sweater and hair piled into bun.